Each year, Lions clubs around the world proudly sponsor the Lions International Peace Poster Contest in local schools and youth groups. 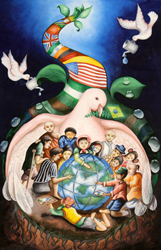 This Contest encourages young people worldwide to artistically express their visions of peace. 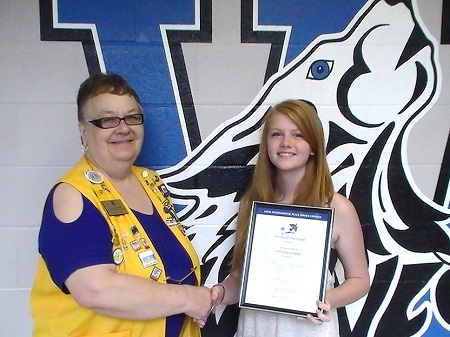 Granton Secretary Lion Barb Tuxford presenting a certificate and a small gift to Morgan McDonald winner of District A1 Peace Poster Contest. Morgan is a student at Wilberforce Public School in Lucan and was sponsored by Granton Lions. 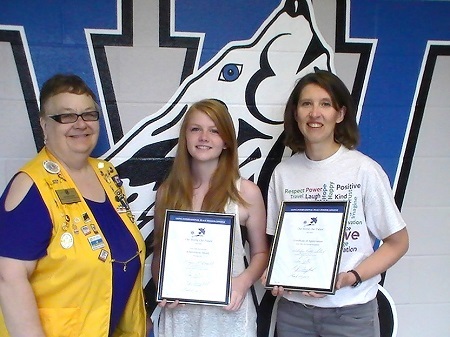 Lion Barb, Morgan and Janine DeVries, who accepted the school's Certificate of participation. St. Patrick's Lucan also participated in the Peace poster program and received a Certificate of Participation. Both schools accepted the information for this year's contest and are very excited to participate again, as Miss DeVries said there are not many outlets for artistic students and she is so glad Granton Lions have adopted this program. Go to the Peace Poster Contest web page on the Lions International web site for kits and other resources to promote the contest in District A1.